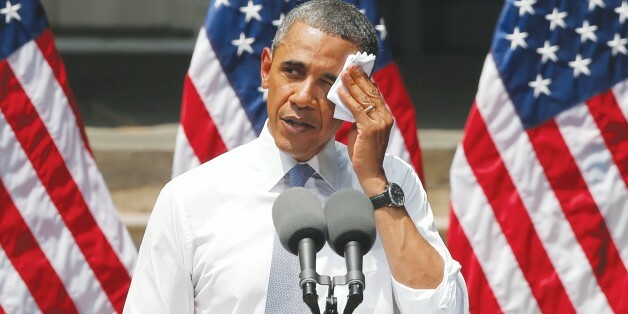 Obama trying to keep cool during his climate speech at Georgetown University. In a stringent attack on Republicans, Obama laid out his climate plan to an enthusiastic audience at Georgetown University on Tuesday afternoon and said now was the time to act on climate change: “In the developing world they don’t have time for the debate about whether climate change is real, they are too busy dealing with the impacts of climate change’’ Obama stated that Americans were not safe from the impacts of climate change, even though Hurricane Sandy could not alone be attributed to climate change; it is a contributor to the increase in extreme weather the US is experiencing. Obama stressed that this should not be a Democratic versus Republican issue, both parties should work together, he went on to highlight that it was actually Republican states that were amongst the leaders in wind power such as Texas, Iowa and Kansas. Texas is also one of the most vulnerable to the impact of climate change as last year’s drought proved. So far there are no legal requirements in the US to cap carbon emissions, but in Obama’s new plan which he crucially would bypass the Congress, with he will direct The Environmental Protection Agency (EPA) to work with states to set regulations for new and existing coal power plants. This would happen in the period 2013-2016. During 2014 The President will in the budget commit to increase funding for clean energy projects by 30% across all agencies, he was proud to highlight his clean energy achievements during his time in office saying: “We doubled the electricity we generated from the wind and the sun, and doubled the miles our cars go by the gallon’’ It needs to be noted though that this include technologies like nuclear, biofuels and clean coal – which everyone might not associate with clean energy. By 2020 Obama hopes to have doubled today’s renewable energy capacity and it should power more than six million homes. Before the speech The Washington Post reported that coal shares had plunged in anticipation of Obama would move to regulate coal power plants. This has prompted industry and Republicans to claim that Obama is leading a war on the coal industry and is trying to kill it. In his closing remarks Obama encouraged the young audience to talk about the climate issue saying: “Speak up for the facts, drive out the misinformation’’ … “Push your own community to adopt smarter practices. Invest, divest and remind folks that there is no contradiction between a sound environment and strong economic growth.’’ These remarks could be translated as another dig towards those Republicans who deny man-made climate change and insist that we can’t have growth and protect the environment at the same time.